Malaysian kuih (or sometimes refered as Nyonya Kueh), Pulut Tekan - Plain Glutinous Rice cake served with kaya (coconut jam). Place 1/3 of glutinous rice in a pan and add water to cover. Mix in blue colouring and soak overnight. Soak remaining glutinous rice overnight, in a separate pan. Drain both portions of glutinous rice. Squeeze out thick santan/coconut milk from grated coconuts and set aside. Add water to the used coconut and squeeze 2 1/2 cups thin santan/coconut milk. 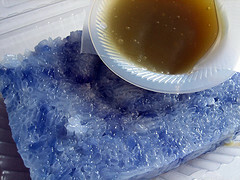 Add 2/3 to uncoloured glutinous rice and the rest to blue-coloured glutinous rice. Steam separately till cooked. Sprinkle thick santan over each and steam another 5 mins. Place steamed uncoloured glutinous rice in a deep rectangular tray and press down hard with banana leaves till compact. Put coloured glutinous rice on top and press again till it sticks to white layer and is compact. Cool, unmould and cut into small thin slices. Serve Pulut Tekan with kaya (coconut jam).